3.	ii. SUSANNAH JANE HENDERSON, b. May 20, 1788, Mifflin County, PA; d.
September 1, 1870, Guernsey County, OH. Abt. 1845 in Guernsey Co., OH. He married MARGARET MOORE 1805.
ii. JOHN HENDERSON, b. 1817. 6.	iii. THOMAS HENDERSON, b. 1819. 7.	iv. ANDREW HENDERSON, b. Aft. 1819. Greene Co., Pa. Which still stands and in a resturant at present. PA; d. September 22, 1890, Guernsey Co., OH. ii. AMELIA ARMSTRONG, b. July 20, 1811; d. July 5, 1890; m. BELL. iii. JOHN ARMSTRONG, b. November 24, 1813; d. February 29, 1824.
iv. THOMAS ARMSTRONG, b. March 12, 1816; d. February 29, 1824.
v.	MCCLAIN ARMSTRONG, b. May 12, 1818; d. September 24, 1891.
vii. MARGARET C. ARMSTRONG, b. February 10, 1824; d. Bet. 1825 - 1918.
viii. ALEXANDER MCCOY ARMSTRONG, b. October 1, 1829; d. August 29, 1832.
ix. SUSANNAH JANE ARMSTRONG, b. April 8, 1832; d. February 2, 1858; m. THEAKER. 9.	i.	AMELIA C.3 HENDERSON, d. 1840.
d. February 10, 1900, Tingley, Ringgold Co., IA. Greene Co., PA, and died March 20, 1877 in Ohio Grove Twp. He married (1) AMELIA C.
12.	i.	SUSANNAH C.4 HENDERSON. 13.	ii. MARGARET AMELIA HENDERSON, b. 1838; d. 1923. 14.	iii. ROBERT4 HENDERSON, b. 1844; d. 1912. 15.	iv. JOHN ALEXANDER HENDERSON, b. 1846; d. 1923.
v.	LIZZIE HENDERSON, b. June 21, 1854; d. April 2, 1881. 16.	vi. MATTIE (MARTHA) HENDERSON, b. 1856; d. 1947. 17.	vii. WILLIAM RAINEY HENDERSON, b. July 1858, OH; d. 1951. 18.	viii. ROSABELLE HENDERSON, b. 1861; d. 1931.
ix. HANNAH JANE HENDERSON, b. Stillborn. 6. THOMAS3 HENDERSON (JOHN 'SQUIRE'2, JOHN ARMSTRONG1) was born 1819. 19.	i.	MAGGIE H.4 HENDERSON. 20.	ii. JOHN MILTON HENDERSON, b. 1847; d. 1915.
iii. WILLIAM THOMAS HENDERSON, b. 1852; d. 1901. 21.	iv. JAMES L. HENDERSON, b. 1855; d. 1905. (1) . He married (2) ROBINSON. 22.	iii. JAMES ROBINSON4 HENDERSON. JAMES WALKER and MARTHA. He married (2) MARY C. PATTERSON 1848. Co., OH; d. June 21, 1920, Guernsey Co., OH. Twp., Guernsey Co., OH; d. 1893, OH. Jefferson Twp., OH; d. 1928, Glendale, CA. MOORE HENDERSON Bet. 1834 - 1840, son of JOHN HENDERSON and MARGARET MOORE. 10. MARGARET3 HENDERSON (ANDREW2, JOHN ARMSTRONG1). She married M. J. STEVENSON. i.	THOMAS ARMSTRONG4 STEVENSON, m. SADIE DUNLAP. iii. DELANA STEVENSON, m. WILLIAM DUNLAP. October 14, 1850 in Guernsey Co., OH, daughter of FRANCIS STEWART and SARAH DRING. 26.	i.	SUSANNAH4 HENDERSON, b. 1839; d. July 14, 1896. 27.	ii. MARTHA MCELROY HENDERSON, b. 1840.
iii. ANDREW PALMER HENDERSON, b. 1842.
iv. AMELIA CLARK HENDERSON, b. 1845.
v.	JAMES HENDERSON, b. Stillborn. vi. REBECCA HENDERSON, b. Stillborn. vii. WILLIAM FORSYTHE4 HENDERSON, b. September 13, 1851, Guernsey Co., OH; m. MARY E. JAMES. 28.	viii. JOHN ARMSTRONG HENDERSON, b. July 9, 1853.
ix. FRANCIS WALKER HENDERSON, b. 1855, Guernsey Co., OH; d. May 23, 1857. OH; d. July 25, 1934, San Antonio, Bexar Co., TX. xi. ALBERT H. ROSS HENDERSON, b. August 1859. Mexico, Audrain Co., MO; m. JAMES NICKEL. xiii. GEORGE PERRY CHASE HENDERSON, b. August 1863.
xiv. LOUETTA BLANCHE HENDERSON, b. February 1865; m. MILTON LARIMOR. BELLE MONTGOMERY, September 25, 1901.
xvi. DONNA DEWITT HENDERSON, b. May 17, 1874; d. As a child. and died 1923. She married WALTER B. ROSS, son of WILLIAM ROSS and ANNIE BELL. ii. MARY ROSS, m. JOHN WIRZ. 32.	iv. ANNA LILLIE ROSS, b. 1870; d. 1933.
and died 1912. He married FRANCES BROWN. Military service: Co. A, 30th Reg., IL, Vol. Inf. i.	FRED5 HENDERSON, b. 1877; d. 1949.
ii. HATTIE HENDERSON, b. 1879; d. 1966. (2) HELEN ROBENA FRENCH 1886. 33.	i.	HARRY FINLEY5 HENDERSON, b. 1878.
ii. LAURA JANE HENDERSON, b. 1881; d. 1953; m. RALPH MCCREARY, 1931. 34.	iii. JOHN ALEX.5 HENDERSON, b. 1889; d. 1944.
iv. MARY HELEN HENDERSON, b. June 12, 1893; d. December 22, 1975.
was born 1856, and died 1947. She married BEACH SMITH 1877. 35.	i.	GLEN5 SMITH, b. 1879; d. 1957. 36.	ii. LAURA JANE SMITH, b. 1881; d. 1945. 37.	iii. BERTHA SMITH, b. 1883; d. 1964.
was born July 1858 in OH, and died 1951. He married CARRIE C. HENRY 1885.
i.	FRANK5 HENDERSON, b. April 1887, IL; d. Abt. 1904. 38.	ii. DEAN (LEON) A. HENDERSON, b. August 1891; d. 1965. 39.	iii. VERNA L. HENDERSON, b. January 1893.
iv. RUBY M. HENDERSON, b. April 1897, IL; m. HUGH PORTER, December 1936. 1880 in Sunbeam, IL, son of JOHN PARK and MARY MARQUIS. 40.	i.	JENNY LAURA5 PARK, b. 1882; d. 1958.
ii. JOHN H. PARK, b. 1884; d. 1960; m. MARTHA HARMON, 1915. 41.	iii. HELEN MARQUIS PARK, b. 1887; d. 1960.
iv. MARY ANN PARK, b. 1888; d. 1964; m. B. EDGAR STANDIFORD, 1925.
v.	PAUL VERNON PARK, b. 1895; d. 1919. 42.	vi. ROSS JAMES PARK, b. 1902. 19. MAGGIE H.4 HENDERSON (THOMAS3, JOHN 'SQUIRE'2, JOHN ARMSTRONG1). She married FRANK LIGHTELL. born 1847, and died 1915. He married VIOLA C. BROWN 1872. 43.	i.	MAGGIE5 HENDERSON, b. 1873; d. 1944. 44.	ii. WILLIAM THOMAS HENDERSON, b. 1876; d. 1950.
iii. BERTHA HENDERSON, b. 1880. 45.	iv. FRANK ARTHUR HENDERSON, b. 1882; d. 1954. 46.	v.	WALTER RAY HENDERSON, b. 1885; d. 1967. 47.	vi. MILTON FLOYD HENDERSON, b. 1889; d. 1945.
vii. CORA REBBECA HENDERSON, b. 1893.
born 1855, and died 1905. He married ELIZABETH HAMILTON 1880.
ii. EDITH HENDERSON, d. 1958.
iii. GRACE HENDERSON, m. BEN WALTER, 1887. 48.	v.	LESTER HENDERSON, b. 1886; d. 1945.
i.	JAMES RH5 HENDERSON, JR.
1869 in Cambridge, Guernsey Co., OH, daughter of ANDREW CLARK and NANCY FORSYTHE. i.	MARY B.5 ARMSTRONG, b. November 24, 1870; d. September 10, 1895. 49.	ii. WILLIAM ROSS ARMSTRONG, b. August 1, 1872, Guernsey Co., OH; d.
50.	iii. ADA LOUELLA ARMSTRONG, b. October 20, 1873, Guernsey Co., OH; d.
Co., OH (Armstrong Mills); d. November 11, 1944, Cambridge,  Guernsey Co., OH. 52.	v.	JOHN CHALMERS ARMSTRONG, b. November 9, 1876, Guernsey Co., OH; d.
November 4, 1952, Cambridge, Guernsey Co., OH. Co., OH; d. May 7, 1959, Cambridge, Guernsey Co., OH. vii. HARRY O. ARMSTRONG, b. April 28, 1881, Guernsey Co., OH; d. Bet. 1882 - 1971.
viii. INFANT SON ARMSTRONG, b. January 12, 1883; d. January 13, 1883.
d. October 7, 1963, Youngstown, OH. GEORGE ALLENDER and MARGARET ADAMS. ii. BLANCHE5 ARMSTRONG, b. Bet. 1875 - 1877, Guernsey Co., OH. iii. ALVIN P. ARMSTRONG, b. December 30, 1881; m. MINNIE ADDY. iv. EDNA G. ARMSTRONG, b. June 6, 1887; m. HOWARD ANDERSON. v.	NANCY M. ARMSTRONG, b. June 20, 1889; m. JOHN WILSON. vi. MARY L. ARMSTRONG, b. October 9, 1894; m. RAY GIBSON. vii. GEORGE CLYDE ARMSTRONG, b. January 31, 1895; m. KATIE WILSON. 1928 in Glendale, CA. He married MARY E. BENNETT October 19, 1882 in Guernsey Co., OH. Fact 1: Migrated to CA where all his children went. 55.	i.	CLARENCE M.5 ARMSTRONG, b. Abt. 1883, Guernsey Co., OH; d. CA. 56.	ii. BERTHA MARIE ARMSTRONG, b. June 22, 1885, Guernsey Co., OH; d.
iii. FRED A. ARMSTRONG, b. Abt. 1887, Guernsey Co., OH; d. CA. and died July 14, 1896. She married FRANK STEWART. born 1840. She married ISAAC O. BAXTER 1866. 57.	ii. LIZZIE VIOLA BAXTER, b. 1867. July 9, 1853. He married FLORA ELLEN MCGAW 1880. 58.	i.	BESSIE5 HENDERSON, b. 1882.
ii. ARTHUR WADDLE HENDERSON, b. 1884; d. 1964.
iii. HABEL MCCOY HENDERSON, b. 1885. Co., IA; d. December 12, 1959, Leesburg, Lake Co., FL. JOHN ARMSTRONG1). He married MARIE. JOHN ARMSTRONG1). He married BLANCHE DAWSON. JOHN ARMSTRONG1) was born 1870, and died 1933. She married DAVID V. WHETZEL 1890. 61.	i.	ROSS6 WHETZEL, b. 1891; d. 1967.
ii. MILDRED WHETZEL, b. 1898.
iii. EDNA WHETZEL, b. 1904; m. HARRY A. KNOTTS. JOHN ARMSTRONG1) was born 1878. He married MARGARET KERR 1908.
i.	BURTON F.6 HENDERSON, b. 1910; m. MARGIE PENDLETON, 1960.
ii. JEAN ELIZABETH HENDERSON, b. 1915. 62.	iii. JOHN PHILIP HENDERSON, b. 1918; d. 1967. JOHN ARMSTRONG1) was born 1889, and died 1944. He married MABEL C. GORDY 1919. 63.	i.	JOHN NELSON6 HENDERSON, b. 1921. 64.	ii. MARY ADALE HENDERSON, b. 1925. 65.	i.	SHIRLEY6 SMITH, b. 1910. JOHN ARMSTRONG1) was born 1881, and died 1945. She married WILL HANKS 1908. 66.	i.	CAROL6 HANKS, b. 1909. 67.	ii. MILTON HANKS, b. 1913. 68.	iii. JANE HANKS, b. 1915; d. 1974. 69.	iv. GLEN W. HANKS, b. 1922. ARMSTRONG1) was born 1883, and died 1964. She married JOE LAW 1905. 70.	i.	ALLEN6 LAW, b. 1906; d. November 1982. 71.	ii. DOROTHY LAW, b. 1908. 72.	i.	RUTH6 HENDERSON, b. 1918. 73.	ii. WILLIAM H. HENDERSON, b. 1920. 74.	iii. CAROL HENDERSON, b. 1938. ARMSTRONG1) was born January 1893. She married ARTHUR SCHWANKE 1917. 75.	i.	MARTHA6 SCHWANKE, b. 1919. 76.	ii. ARTHUR JR. SCHWANKE, b. 1921. 77.	iii. RICHARD SCHWANKE, b. 1923. 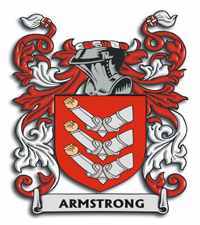 ARMSTRONG1) was born 1882, and died 1958. She married THOMAS LOVE ANDERSON 1910.
i.	WYLLYS ELIZABETH6 ANDERSON, b. 1913; m. J. LINDLAW, 1950.
ii. HELEN MARY ANDERSON, b. 1922; m. BURTON ANDERTON, 1958. ARMSTRONG1) was born 1887, and died 1960. She married LESLIE ANDERSON 1911 in IL. 78.	i.	ANNABELLE6 ANDERSON, b. 1912. 79.	ii. EVELYN MARGUERITE ANDERSON, b. 1915. ARMSTRONG1) was born 1902. He married MARY E. DWORSAK 1949.
i.	BETSE RILEY6 PARK, b. 1939.
ii. JAMES ROSS PARK, b. 1942; m. CHRISTINA LINDA KEITH, 1965.
iii. CHRISTINA PARK, b. 1951.
born 1873, and died 1944. She married MARL M. OVERMIRE. 81.	ii. DAUGHTER OVERMIRE, b. 1892. 82.	iii. MAY OVERMIRE, b. 1898.
iv. HAROLD OVERMIRE, b. 1904; d. 1929. 83.	i.	SILAS MILTON6 HENDERSON, b. 1909. 84.	ii. GUY PORTER HENDERSON, b. 1913. ARMSTRONG1) was born 1882, and died 1954. He married BETTY WOODWORTH 1916. 85.	i.	JOHN W.6 HENDERSON, MD. 86.	ii. MARY VIOLA HENDERSON, b. 1919. 1920. He married (2) MARGARET LUCAS 1922. 88.	ii. MARGARET JOAN HENDERSON, b. 1927. 89.	iii. WALTER RAY II HENDERSON, b. 1929. 90.	iv. MARY HENDERSON, b. 1934. ARMSTRONG1) was born 1889, and died 1945. He married MARJORIE EDWARDS. 91.	i.	ELIZABETH6 HENDERSON, b. June 15, 1922. 93.	ii. JOYCE HENDERSON, b. 1922. May 7, 1948. He married JULIA MILLER Bet. 1891 - 1920.
i.	BESSIE FLORENCE6 ARMSTRONG, b. November 28, 1899; d. 1979.
ii. ARTHUR RUSSELL ARMSTRONG, b. October 9, 1903; d. September 19, 1978.